Among the most famous and sought-after trekking regions, the Annapurna region is one of the most naturally gorgeous and popular regions pursued by thousands of trekkers every year. With a fantasy-like setting, the region gives a mystical vibe to the trekkers aspiring to explore the region. With Gurung and other ethnic communities providing heart-warming hospitality throughout the trek, you cannot help but feel awed by the tender reception. The trek starts from the lake-side city of Pokhara- the tourism capital of Nepal. Trekkers go through many ethnic Gurung and Magar villages of the region, like Ghandruk, Chhomrong, and Deurali among many others. All along the journey, towering views of the Annapurna peaks loom over the track quite majestically. Furthermore, the trekking trail also goes through the Jhinu Dana village where there are naturally occurring hot springs famous for their healing properties. 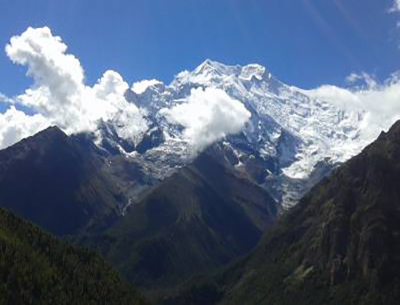 The Annapurna Base Camp Trek is a moderate trekking trip where trekkers are presented with awe-inspiring views of peaks like the Annapurna range I (8091m), Annapurna II (7937m), Annapurna III (7555m), Annapurna IV (7525m), Machhapuchhre Himal (6997m), the Hiunchuli Peak (6441m) and many more. It is a great opportunity to learn about the ethnic Magar and Gurung cultures of the region as well. The trekking trail goes through lush woods of rhododendron and alpine trees and the terrain is adorned with many brooks and streams. The Annapurna Base camp Trek incorporates the best features of the region to give trekkers an unforgettable experience. The wonderful landscape of the region presents some of the most astounding ecosystems of Nepal as well. The vast snowy acreages at the higher elevation and the transition of the alpine woodlands into sparse fields make trekking quite magical. 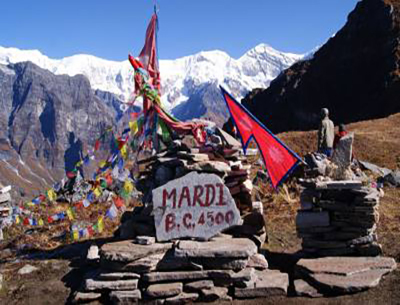 The best times to do the Annapurna Base Camp Trek are during the months of March to May and September to December. With a passionate and goal-driven team, we aim to prioritize the comfort, safety, and satisfaction of our clients. Our transportation, accommodation and guide services are the best in the business to ensure that the journey you undertake surpasses every one of your expectations. Join our professional team at Destination Unlimited for a trekking experience of a lifetime. One of our staff will be waiting for you when you arrive in Kathmandu. He will help you get transferred to your Hotel. There is nothing else planned for the day, so you can just relax at the hotel and get your bearings. Overnight stay at the Hotel. On this day, you can explore the city and visit its Heritage Sites. There are four major UNESCO World Heritage Sites in Kathmandu that you can enjoy a tour of. The sites are the Pashupatinath Temple, the Boudhanath Stupa, the Swayambhunath Temple and the Kathmandu Durbar Square. You will also prepare for tomorrow's trek on this day. Overnight stay at the Hotel. Early in the morning, you will catch your flight to the beautiful lakeside city of Pokhara. As you reach the city, you can get amazing views of the Annapurna peaks and the Machhapuchhre (6997m) that are situated quite close to Pokhara. From here, you will be trekking out into the beautiful valley, through lush woods and towards Ghandruk- one of the popular Gurung villages of the Annapurna region. 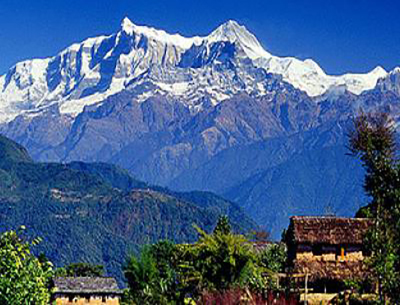 Along the way, you can catch amazing sights of the Annapurna peaks as well. Overnight stay at the guesthouse. From Ghandruk, you will move through the woodlands to Deurali along a steep gradual climb. From here, you will trek to Banthanti. Further down, you will reach Tadapani. Moving through the village, you will cross the Kimshung River ahead and ascend to reach the village of Gurjung. From here, a straight climb leads to Chhomrong. Overnight stay at the guesthouse. There are dainty stone steps that lead away from Chhomrong. Going down the stairs paved into the stone from the cliff, you will trek to the Chhomrong Khola and steeply climb to the village of Sinuwa. You then head on a trail that takes you to Kuldighar. Going through the woodlands of rhododendron, you will reach Bamboo. Overnight stay at the guesthouse. From Bamboo, you will take a steep descent to Dovan, a Magar settlement located at the bottom of a gorge. Passing along plenty of waterfalls, you will reach clearings dotted with glacial rivers. From here, you will ascend to the Hinku cave. After a short walk, the trail drops down to the river and then ascends again towards Deurali. Overnight stay at a guesthouse. From Deurali, you will make your way to the base camp of Annapurna, passing by the Machhapuchhre Base Camp. The climb is slow and strenuous, but the journey is worth the effort as from the base camp, you can get titillating views of the Annapurna Peak (8091m), the Machhapuchhre Himal (6997m), Mount Gangapurna (7454m), the Tent Peak (5695m) and the Hiunchuli Peak (6441m) among many others. Along the way to ABC, you will notice the change in the vegetation as well. Overnight stay at the base camp. 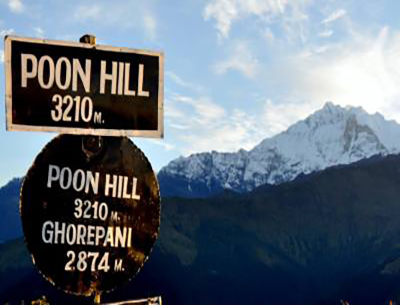 After enjoying the spectacular sunrise amidst the Himalayan peaks from ABC, you will head back again, following the same trail through MBC, Deurali, and towards Bamboo, going through dense woods of pine and cedar and passing terrains where the blooming rhododendrons form colorful gossamers from the canopies. Descending along Deurali and Dovan, you arrive at Bamboo. Overnight stay at the guesthouse. From Bamboo, you will trek ahead towards Sinuwa from where the trail traces back to Chhomrong. After a short descent, you will reach Jhinu Danda- known for its natural Hot Springs. You can take a relaxing bath in the natural springs and sooth your muscles here. The hot spring at Jhinu are known for their healing properties, and many people from all parts of the country visit the village to enjoy the springs. Overnight stay at the guesthouse. Trekking alongside the Modi Khola, you will continue through the verdant landscape and reach Birethanti- a beautiful Magar town from where the view of the peaks are quite amazing as they surround the skyline in a dramatic fashion. From here, the trail leads to Nayapul. From Nayapul, you will drive back to Pokhara. Stay overnight in a Hotel. From Pokhara, you will say goodbye to the Annapurna Mountains and make your way back to Kathmandu, driving along the same lush hill-landscape. Along the way, you can enjoy the fading mountains and watch it be replaced with terrace farms of rice and barley. You will be transferred to your hotel where you can opt to relax or explore the nearby areas. Overnight stay at the Hotel. Today, you can spend the day in Kathmandu as you please, sightseeing or shopping as per your preference. You can shop for souvenirs at Thamel where there are lots of shops that cater to tourists or you can enjoy the many different restaurants and diners that serve continental cuisines. Overnight stay at the Hotel.